Let’s look at a negatively geared property, compared to positively geared property, by working through a hypothetical example. Let’s assume for simplicity you have managed to save a deposit of $89,400 and you earn a gross annual salary before tax of $65,000 per year. You’re looking at purchasing a 2 bedroom townhouse in Coburg North, Victoria and you intend to rent the property out to a tenant. How much are you likely to receive in rent? Currently the market rent is around $420 per week, so you would get approximately $420 x 52= $21,840 per year in rent. You would then deduct say 8% for a real estate agent to manage the property and the tenants, so your rental income would drop to about $20,092 per year, which is $386 per week. Now, let’s say you want to use your $88,000 as a 20% deposit for the property you buy, to avoid paying Lenders Mortgage Insurance, which costs thousands and protects the lender. Excluding the purchase costs such as stamp duty etc, an $89,400 deposit would mean you could borrow an additional $357,600 and therefore buy a property for $447,000. You can view a recent 2 bedroom townhouse in Coburg North, VIC that sold for $447,000 here. If you had purchased the above property with a 20% deposit (excluding all transaction costs) would it be positively geared or negatively geared? At an interest rate of 4.5% per annum (even though ASIC recommends making sure you can pay back the loan at 7%, which would bring the repayments to $609 pw) on a mortgage of $357,000 your weekly repayments on your investment property mortgage would be $452 and you would only be receiving around $386 per week in rental income. This gives you a weekly loss of $66. If we factor in council rates of $1,244 per year your weekly loss becomes $90. The above is an example of a negatively geared property, because the rental income does not cover the expenses. If the above property was positively geared, you would need to be able to get at least another $100 per week in rent (assuming roughly 10% management fee). Note 1: The above example did not mention further costs that would be involved in the transaction, for example, tax on the transfer of the property would have been $21,890, bringing the original $89,400 deposit down to below 20%, thus requiring the extra expense of Lenders Mortgage Insurance. How does negative gearing increase house prices? How does negative gearing help push up house prices in Australia? Let’s go back to our example above about buying a 2 bedroom townhouse in Coburg North. Let’s pretend you are a first home buyer and your best friend is an investor. We will assume you are both earning $65,000 per year, you both have a $10,000 credit card limit and you have both managed to save $89,400 as a deposit, with everything else equal. Let’s pretend you have both done your research and you have both gone to a mortgage broker before bidding on anything to look at how much you can borrow and what your repayments may be. When you’re with the mortgage broker, the rough estimate of how much you can borrow comes in at $390,000 as you are going to live in the property. When your friend does the estimate of how much he/she can borrow as an investor, the figure comes back at $581,000. Even though you both have the same income and the same deposit, your best friend can now outbid you at any auction you both go to by the tune of approximately $190,000. This is possible because as an investor, your best friend can include at least 75% of the expected rental income when the lender calculates how much he/she can borrow. Because investors are able to borrow more than home owners, they can outbid home owners at auctions, which helps to push up house prices above what they would be if they could not borrow more than home owners. This line has been used by our current Treasurer, Joe Hockey, not to mention many others before him. A quick way to address this objection is to point out that between 1985 and 1987 when negative gearing was removed, only Sydney and Perth had a real increase in rental prices whereas rental prices in Adelaide and Brisbane fell sharply and Melbourne had low or no growth over the period. The ABC recently did a full Fact Check on Joe Hockey’s use of the “rental prices will go up if we remove negative gearing” line which you can read in full here. The fact check concluded that the line, “doesn’t stack up”. Objection 2: Property investors provide rental houses and if they stop buying houses and making them rentals, no one else will be able to supply the rental market. The quickest way to dissect the above view is to run a hypothetical auction in your street this weekend, which we can do right now. Imagine it’s Saturday and you are attending an auction in your street for a house that’s for sale. The auction begins and a few people are raising their hands making their bids. Of the people standing around you who are bidding, they are either home owners or they are investors. The home owners bidding are either first home buyers, who would move out of a rental (or their parents) if they secured the property or they are home owners who already own a property which they would sell if they secured the house on your street. The investors bidding will rent the house out to a tenant if they secure the property. Now, if negative gearing had been removed and the investor didn’t bid as high as he/she would have done otherwise (because he/she won’t be able to claim the loss from the property against his/her wage) and the home owner was the winning bidder, does it matter that the investor isn’t able to offer the house to rent? Remember that if the investor doesn’t buy the property, there is a chance that a first home buyer will, who will then vacate a rental property, freeing up a rental property for someone else. So the view that investors are providing a useful service by buying houses and making them rental properties can be countered simply by looking at the other side of the coin, that if they weren’t buying houses, home owners would be, who would then not need a rental property. In short, negative gearing encourages people to take on debt and buy something that makes a loss now, in the hope that someone else will come along in the future, take on even more debt and pay even more for the property, so that the first person can make a profit. 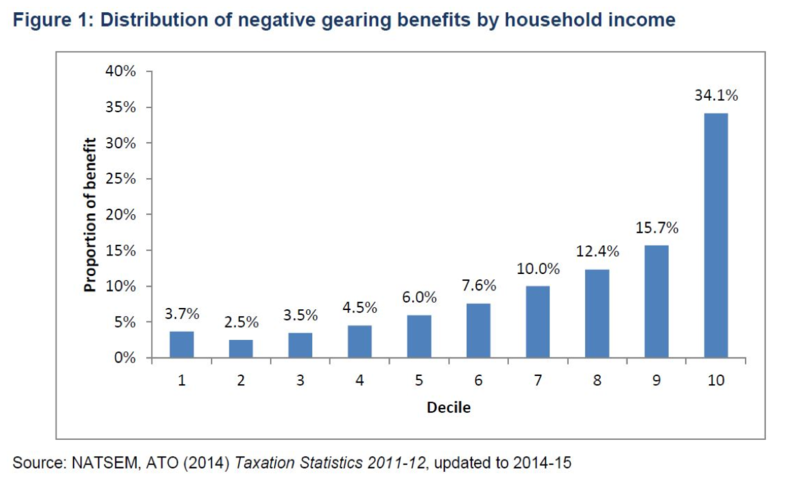 While people with normal jobs do use negative gearing, the majority of the benefit of using negative gearing and selling investment properties at a profit goes to those individuals in the top income bracket. 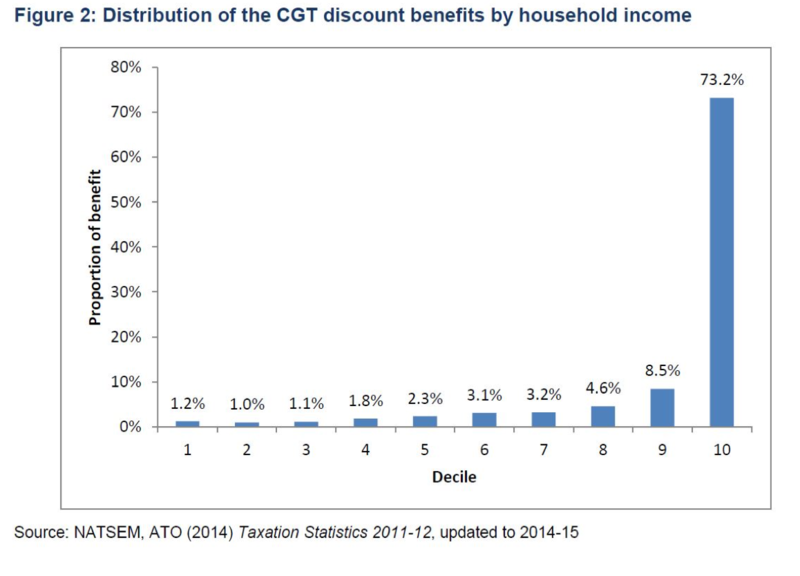 This can be evidenced from two important charts, one showing the distribution of negative gearing benefits by household income and the other showing the distribution of capital gains tax concession benefits by household income. The charts below are from this article. 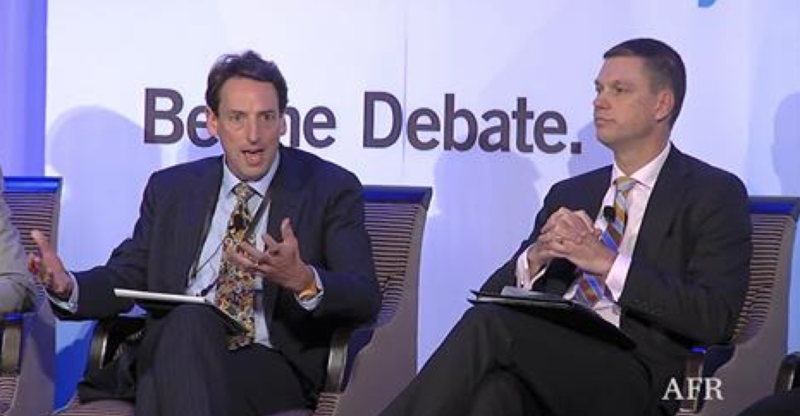 In addition, here is a link to a great 2 minute exchange between John Daley from the Grattan Institute and Ken Morrison from the Property Council on negative gearing and whether it’s a good thing for middle Australia. 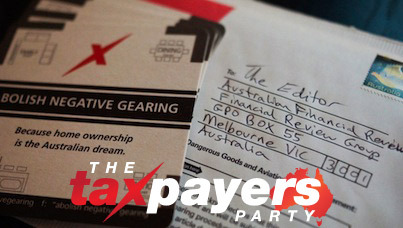 Objection 4: There are many factors pushing up house prices, not just negative gearing. The above view is completely correct. However, if it’s used as an excuse to do nothing about negative gearing, then it doesn’t hold, because each and every one of the factors that helps to artificially drive up house prices higher than they would be otherwise, needs to be addressed. There are both supply side issues and demand side issues. Both need to be addressed. 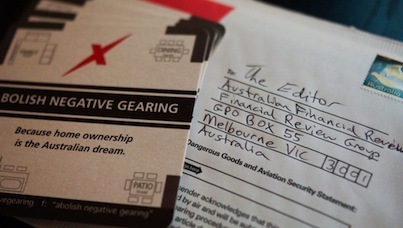 How do we remove negative gearing safely? A safe and responsible way to remove negative gearing is to phase it out over time and do it in line with the Reserve Bank of Australia (RBA) target inflation rate. The RBA’s main role is to try and keep inflation between 2 and 3 per cent each year, by using interest rates to influence demand. If average house prices rise by more than the equivalent of three per cent per year, over any three month period, wind back the maximum loss that can be claimed from a negatively geared property by ten per cent. For example, let’s say that in July 2015 average capital city house prices are $600,000 and that by the end of September 2015 (three months later) they have risen to $606,000. If house prices continued to increase at the same rate, by July 2016 they will be $624,000 which is an annual increase of 4 per cent and higher than the RBA target for inflation. So, because in September 2015 we can see that house prices are rising by the equivalent of more than 3 per cent per year, the maximum loss that can be claimed from a negatively geared property would be reduced by 10 per cent. If by the end of December 2015 house prices have only increased over that three months by the equivalent of less than 3 per cent per year, then no change in the negative gearing rules would be made at that point.